Dancer Anna Westberg and double bass player Nina de Heney have collaborated as a duo for more than fifteen years. The focus of their work has been on improvising and creating instant compositions: to find a creative flow on stage. They have performed at traditional venues as well as in various contexts, outdoors, in churches, art galleries, castles and bars. 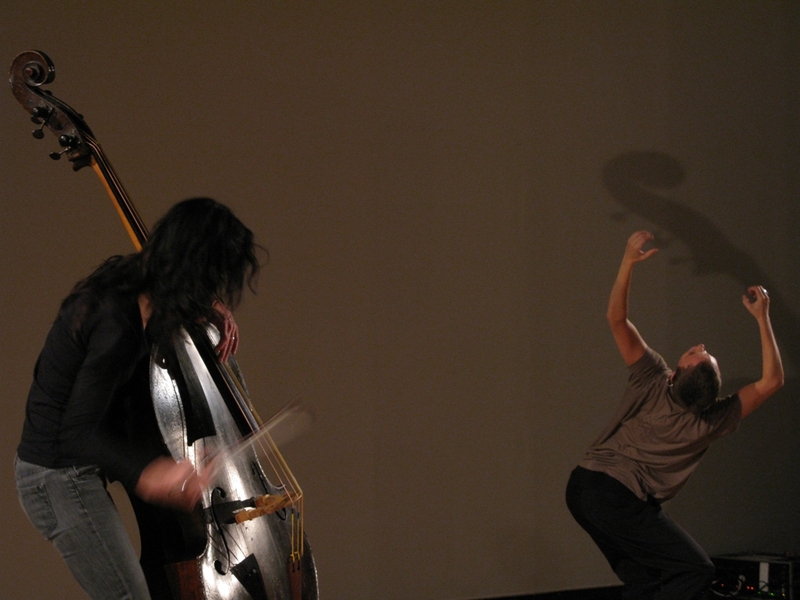 When awarded in 2007 the Sten A. Olsson Culture Award, they decided to invite other duos with the same constellation, dance and bass – and this was the birth of the concept Dance’nBass. While exploring this field, they realized that there were many more who had fallen for this particular combination. There obviously is a special attraction between the dancing body and the double bass. Dance’nBass wants to highlight this fact. After the first successful event at Atalante 2008 in Göteborg, the festival has been recurring every year in a different guise. Dancer based in Göteborg, has a classical ballet education with further studies in improvisation and release techniques. Anna has since 1989 been active as a free-lance dancer. She has collaborated as a soloist with choreographer Gunilla Witt, toured children performances, initiated the improvisation group Floke, performed site specifics in the constellation Skogspunk, among many other things. bassist, grew up in Switzerland, moved to Sweden in 1983, and studied from 1988-93 at the Gothenburg Conservatory of Music, where she also completed a Soloist Diploma 2004-06. She has been free-lancing on the jazz and improvisation scene in Sweden for many years with a number of groups, currently with Lisa Ullén-Nina de Heney duo and Acoustic Electronics. Nina started doing solo performances in 1992, often collaborating with dancers.